This profile first appeared in theOctober 2012 issue of New Mexico Magazine. Writer Kent Black was recognized with the Silver Award in the Profile category, by the International Regional Magazine Association during its annual conference in Baltimore, Maryland, September 30, 2013. Camp Leatherneck is a Marine base in the Washir district of Afghanistan&apos;s Helmand Province. It&apos;s inhospitable country, with huge, rolling sand dunes and a few ancient villages. One evening at dusk three years ago, AnnaMaria Cardinalli, a native Santa Fean working for the Joint Military Command, walked away from camp and into the desert. She wanted a private place to sing "Che Faro" (What Is Life), an aria made famous at the end of World War II by English contralto Kathleen Ferrier. "That song says everything about the experience of war," Cardinalli, 32, mused recently over lunch at the Pink Adobe&apos;s Dragon Room. "It asks, &apos;Who am I now? Who am I without you?&apos; Because after the experience of war, you&apos;re really not sure." 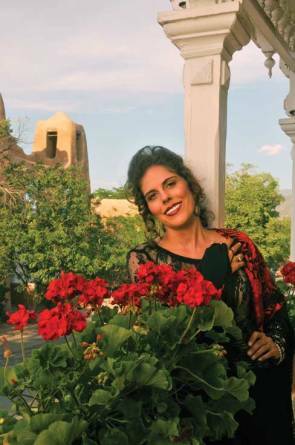 This last year, Cardinalli&apos;s posting of her version of "Che Faro" on YouTube garnered over 100,000 views in a matter of weeks, but that night, out on the Helmand dunes, she was singing to the moon and the seemingly limitless desert and sky. Then, when she&apos;d finished, a voice in the distance sang back the scale of her aria. "It was the muezzin [the prayer caller] from a nearby village," she recalled with wonder. "And then I sang the scale back to him so he&apos;d know I&apos;d heard him. It was this beautiful, very human exchange. That&apos;s why I chose music as a life path. It breaks down barriers and shows us that we&apos;re not alone. It&apos;s a salve that we can apply to each other&apos;s souls and psyches." A friend of mine once said, about meeting the late playwright Jay Presson Allen, "If you&apos;re not intimidated, you&apos;re not paying attention." The same may be said of Cardinalli. She&apos;s had a successful career as a Spanish guitarist, graduated from St. Mary&apos;s College at 18, got a master&apos;s degree from St. John&apos;s College in Santa Fe, and at 25 became the youngest person to earn a Ph.D. from Notre Dame, in theology. Cardinalli has been an employee of the FBI and the Department of Defense, and was a Navy ensign. She was deployed to Iraq and Afghanistan in intelligence work, and is currently a professor at the American Military University. Despite the martial bent, her greatest passion is opera; in August, she made her professional debut as a principal at the International Lyric Academy&apos;s Tuscia Operafestival, in Puccini&apos;s Suor Angelica. Yet the woman seated at her favorite window-side table in the small bar on Old Santa Fe Trail is warm and engaging, the kind of person who&apos;s never met a stranger. She laughs easily, even at the corniest jokes, and while articulate and quick-witted, generally deflects credit for her accomplishments to her mentors—especially her mother, Giovanna Cardinalli. It hasn&apos;t been a cakewalk. Cardinalli has run into challenges that not only threatened her career, but her life. Still, it&apos;s difficult not to feel just a twinge of irritation, the tiniest grain of exasperation, when her longtime friend Fran Levine, director of the Palace of the Governors and the New Mexico History Museum, says, "She also makes the best martini I&apos;ve ever had." After lunch, we walked toward the Plaza and made our way through a light rain to the Cathedral Basilica of St. Francis of Assisi. Because her debut in Tuscany was only two months away, she liked to go into churches to test her contralto against the acoustics. "I&apos;ve lost count of the churches I&apos;ve been kicked out of [for singing]," she admitted with a low laugh as we sat down in a middle pew. "I&apos;ve always been a very devoted Catholic, but not a very pious one." AnnaMaria&apos;s parents, in fact, met at a Catholic college in California. Her mother, from a Sicilian fishing family in Martinez, across the bay from San Francisco, was the first woman to be admitted to St. Mary&apos;s. Her father, David Padilla, comes from a family that has been in northern New Mexico since the reconquest, in 1692. "I am so proud of that combination," Cardinalli said. "There&apos;s a perfect duality to being half Spanish and half Italian. The Spanish love drama and austerity . . . the dryness and intensity of the air and the sunlight. The half of me that is Italian loves passion and drama as well, but in a more flowing sense." An only child, AnnaMaria was speaking complete sentences at six months, and her mother recalled that bedtime reading shifted from "Winnie the Pooh to opera stories" by the time her daughter was two and a half. One day, when she was three, her mother was folding laundry and watching The Merv Griffin Show. Charo was a guest. Though best remembered for her wild hair and malaprops, Charo is a brilliant guitarist, having studied under the great Andrés Segovia. AnnaMaria was mesmerized by Charo&apos;s performance, and begged her parents for a guitar. They relented. She listened to Segovia every night before she went to bed. When Segovia passed away two years later, she wore all black to kindergarten the next day. Cardinalli released her first CD of guitar music, Quinceañera, when she was 15, and has since performed on nearly a dozen more. Expelled from Santa Fe&apos;s St. Michael&apos;s High School when she was 13 (for reasons she won&apos;t divulge), she undertook a long-distance education program, and finished high school in one summer. When word got around town of her knocking off three grades in three months, other students and parents clamored for her secret. She wrote it out in a small book called Why Wait? Graduate, published by Northwest Press. She was 14 when she joined George Will and Sam Donaldson at a joint book signing in Washington, DC. AnnaMaria chose our pew so that we could have an unobstructed view of Santa Fe&apos;s famous statue of La Conquistadora. As a child, Cardinalli prayed to La Conquistadora every day for a successful career, and promised to sing "Ave Maria" at every shrine to the Virgin she encountered. Touring Italy with her parents when she was 14, she talked them into taking her to St. Paul&apos;s Basilica in the Vatican.While there, they heard from two Swiss guards that Pope John Paul II would make an appearance in the basilica the next day. AnnaMaria and her parents arrived early, and as the crowd grew, they were pushed closer and closer to the front, until they found themselves standing before the Pope and his cardinals. Several choirs from Eastern Europe were there to perform, and during a lull between groups, AnnaMaria stepped forward and sang "Ave Maria." The cardinals blessed her voice. While at St. John&apos;s pursuing her master&apos;s degree, she signed with a major record label eager to capitalize on a beautiful young woman who could play Spanish guitar like a master. Then, a drunk driver in Santa Fe smashed into a car in which Cardinalli was a passenger. The left side of her face was ripped open. In typical Cardinalli fashion, she continued to perform, turning the injured side of her face away from the audience. Cardinalli recalled the record company saying, "Sorry, you used to be the total package, but we&apos;re dropping the contract because you&apos;re not pretty anymore." She doesn&apos;t look back with bitterness, pointing out that all the incredible things that have since taken place in her life wouldn&apos;t have occurred otherwise. She decided at the time that she would not allow her future to be determined by her looks, and so resolved to pursue a Ph.D. and have the option of an academic career. She also decided to pursue her childhood dream of becoming an opera singer. "The happiest day of my life was when I was a little kid and my mom and grandma took me to the Lensic Theater here in Santa Fe to see the Carlo Rossi production of Carmen," she said, lighting up at the memory. "They took me to Señor Murphy&apos;s across the street, and bought me a bag of different-colored licorice. I was so excited about that licorice. Then I went across the street with my bag of licorice to see the movie. I have never been more mesmerized in my life. From that day on, I wanted to sing Carmen. I wanted to be Carmen." Cardinalli joined the The Santa Fe Opera&apos;s youth choir. Unlike her young peers, who treated the opera complex as a playground, she proudly strode around with her score tucked under her arm, often questioning the principal singers about various aspects of the production. SFO founder John Crosby and his successor, Richard Gaddes, took a shine to the little prodigy. Gaddes eventually sent her to audition for a young-artists program judged by the New York Metropolitan Opera&apos;s Mignon Dunn. Impressed, the famous mezzo-soprano sent Cardinalli to Janice Pantazelos, one of the world&apos;s top voice teachers. Pantazelos agreed to let Cardinalli audition. "She had a dark, haunting voice, but she had no technique. She sounded muffled," recalled the Chicago-based mezzo, who works with only a few students. Still, Pantazelos recognized raw talent and determination, and agreed to coach her. "I only take on students who I believe have the potential to succeed." For the first year, Cardinalli commuted between Santa Fe and Chicago. Her decision to pursue a doctorate in theology at Notre Dame was motivated at least partly by an easier commute to Pantazelos&apos;s studio. Not long after joining the Irish in South Bend, Cardinalli was asked to leave the dorms because of her nonstop musical practice. Her parents bought her a house near campus, and her social life blossomed. Having always related better to adults than to her peers, she was finally among equals in both age and talent. Her house became the scene of Sunday ice-cream socials for Notre Dame&apos;s theology department that involved a lot more exotic liqueurs than tubs of Rocky Road. For her Ph.D. work, Cardinalli chose to study and write about the alabados (songs of worship) of the Penitentes, a lay fraternity whose roots go back 1,000 years, to medieval Spain. "I am so passionate about the heritage of northern New Mexico and how it&apos;s expressed musically," she said. "You hear Arab and Jewish melodic influence, and you also hear harmonies of the Church. You get this music that celebrates this cross-cultural convergence." In post-9/11 America, it wasn&apos;t long before Cardinalli&apos;s fascination with Islamic influences on the Penitentes&apos; music came to the attention of the FBI, who, she said, were "looking for people who had advanced degrees and interest in the cultures and religions of the Middle East." One of Cardinalli&apos;s difficulties in living off campus was her lack of a vehicle—she had no way of getting to the supermarket. It so happened that the FBI recruiter on campus was a young man with a red convertible, and Cardinalli made a deal with him: If he&apos;d drive her to the market and back when she needed groceries, she&apos;d listen to his pitch. Before her cupboards were full, Cardinalli had made a momentous decision: The diva was going to be an agent for the FBI. After finishing her dissertation and graduating from FBI training at Quantico, Cardinalli worked as an intelligence analyst, doing classified work that she cannot discuss. After two years with the FBI, she was transferred for duty with the Joint Special Operations Command in Iraq. It was there, in 2009, that she was contacted by the Department of Defense for “human-terrain work” in Afghanistan. Human-terrain work is a process of gaining local knowledge so that U.S. troops can better understand the cultures of areas where they’re engaged. These specialists are the first to enter a new village—unarmed. Their mission is to engage the local populace in a dialogue and learn the local situation. It’s risky business. Several months before, a human-terrain specialist was talking with a fuel dealer in an Afghan marketplace when the man doused her with kerosene and set her on fire. She died several agonizing months later. It took her some time before she discovered the truth about the boy she couldn’t get out of her mind. There is a disturbing, centuries-old tradition among some Pashtun men called bacha baz (that translates as boy player) in which older men take young boys as lovers. In a culture where interactions between men and women are strictly proscribed, this tacitly accepted pedophilia flourishes. Cardinalli realized that the instinctive fear she felt for her brilliant, multilingual, pint-sized mechanic was not the horror of war, but a horror of a different ilk. Her report on the phenomenon, “Sexuality and the Pashtun,” was a classified document until Wikileaks got hold of it. Then, a feature story on it appeared in the San Francisco Chronicle. The resulting controversy (Cardinalli’s academic qualifications to write about the issue were questioned) thrust the recently commissioned Naval ensign into an unwelcome limelight. While Cardinalli’s deployment was spent as a civilian employee of the Department of Defense, her experiences convinced her that she “needed to be in uniform.” She joined the Navy, but wasn’t able to accept her commission until 2010, when she returned from Afghanistan. Though discharged from the Navy because of her injury, Cardinalli contacted friends from her former unit who were also musicians, to help other veterans suffering from traumatic injuries or post-traumatic stress disorder. She found in her research that one of the most useful recovery tools for such cases is teaching the person to play an instrument. She and her fellow veterans founded Jams for Vets in 2009, with the mission of going into VA hospitals to teach recovering veterans to play instrument, or provide instruments to those who already can play one. Next to her determination to create a career for herself in opera, Jams for Vets is the closest thing to Cardinalli’s heart. The Basilica of St. Francis had been filling up with worshippers and tourists, and there was too much activity for Cardinalli to get away with singing more than a few stanzas. She looked around, then nodded toward the Blessed Sacrament Chapel. We made our way to its rear entrance. It was still, quiet, and empty. I asked what drives her. Learn more about Cardinalli at annamaria.ws. To purchase music or DVDs by her, go here. To see more of Karen Kuehn&apos;s work, visit karenkuehn.com. Cardinalli&apos;s moving tributes to current soldiers and veterans take the form of videos that feature photographs and her own voice, singing arias in accompaniment. These videos went viral soon after their release on YouTube.